Over the course of the year, KTHFS has been experiencing great momentum and we look forward to bringing in a set of new distinguished individuals to further improve the organization. To apply, please send an email to info@kthfs.org, including your CV and a Cover Letter. Specify at least 2 Board positions that you would like to pursue in prioritized order. Please mark the email "Application KTHFS Board 2019". 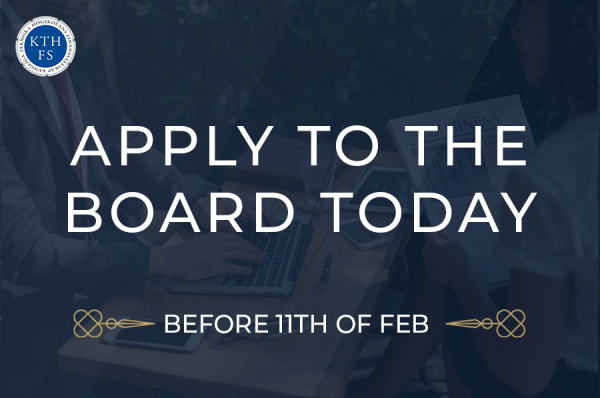 Moreover, if you for any reason feel that you do not want to pursue an actual Board Position with the level of responsibility such a position implies, we would like to stress that everybody who wants to contribute in any given way is welcome and that you do have the ability to become a so-called "Project Member", working together with the Board Members in a particular project, being involved in a way that fits you. If this opportunity interests you, or if you have any particular idea you would like to express to the Board, please do not hesitate to contact either of us or send an email to info@kthfs.org. If you have any questions whatsoever about KTHFS, do not hesitate to contact us. We look forward to receiving your application. Interviews will be held on a rolling basis, so make sure to apply as soon as possible. Application Deadline: Monday, February 11.